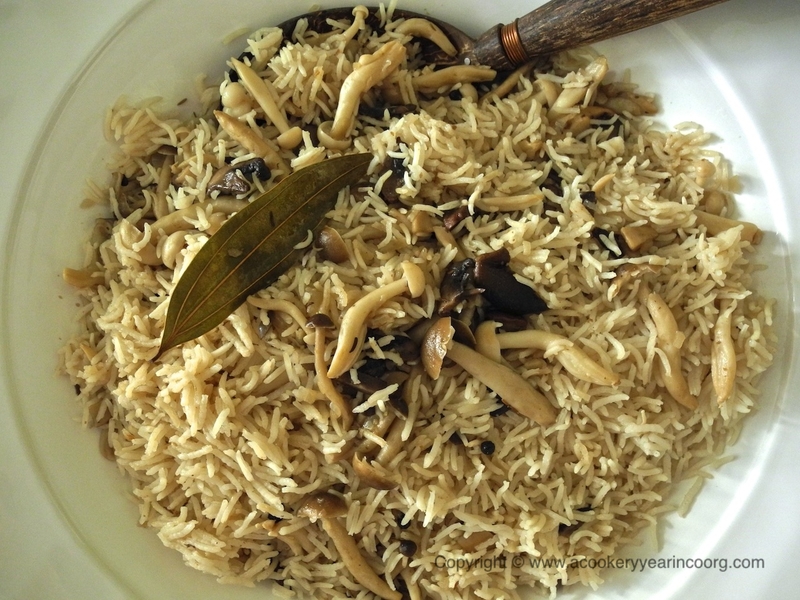 A delicate pulao, inspired by memories of Kashmir! Wash the rice thoroughly in several changes of water. Drain and set aside. Clean the mushrooms if necessary.Pick apart or slice into pieces about 2-3 Inches in size. If using dried mushrooms, chop or grind them coarsely and pour one cup of boiling water over them. Let steep for 20 mins. In a deep pan, heat the ghee. Drop in the cassia leaves, followed by the peppercorns. Stir for a minute, then sprinkle on the shah jeera. Stir for half a minute more, then add the minced shallots to the pan. Sautée gently until they turn translucent, then add the sugar to the pan. Continue cooking until the shallots begin to brown a little. Add the mushrooms to the pan, mix thoroughly and cook uncovered until they begin to release moisture. Cover and cook for 3-4 minutes. Uncover the pan and add the rice and ginger juice, along with the hot water and salt. Stir to mix. Bring the mixture to a fast simmer and keep it there for a couple of minutes. Stir, then cover, lower the heat, and cook on very low heat for 15- 20 minutes, or until the rice has absorbed all the moisture. Allow to cool slightly before turning out onto a platter. * If it’s not available, use the other “shah jeera” that looks a little like a caraway seed, but tastes like a milder cumin, or regular cumin.